Many Bothans died to bring us this information. (Or, erm, David at Ableton gmailed me.) Admiral Ackbar, please. Racks: Like to combine different instruments and effects for performance? The new rack/macro configuration looks just fantastic. It looks to combine everything I loved about the Combinator in Reason 3 (powerful and easy layers, splits, and effects chains, savable as custom presets) with Ableton-style ease of use, the ability to use plug-ins, and eight knobs instead of Combinator’s inexplicable four. Not sure if you’ll be able to toggle effects and such as easily as in Combinator, though; will be interested to try that. 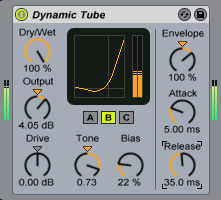 Incidentally, Ableton, I’d love to know what this particular chain sounds like. Operator + Absynth + tube? Mmmmmm. In other news, look out, KORE, because Ableton users may find this less-ambitious but more approachable means of creating layered instruments more friendly and functional. Meters: Meters are vastly improved in a revision most current users will welcome. 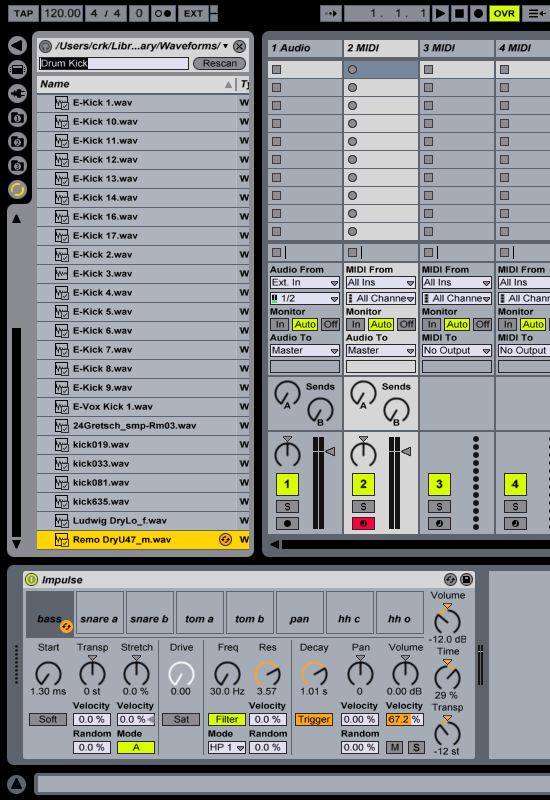 This is clearly part of Ableton’s push to get Live some respect as a full-fledged DAW (which it is). They’re both more readable and more accurate; check out those numeric readouts and clipping meters. Note length: Remember the dark days when Live’s quantization lacked note length quantize? 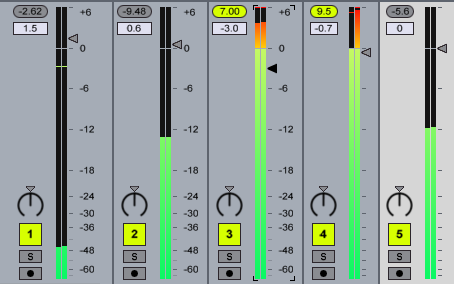 Now, Live 6 will add real-time note length filtering to the existing quantize setting. The results are something I haven’t seen before; this is more like a key-scaled gate and should actually have some creative applications. Filters and pitch envelopes: This takes an approach similar to Operator, though I’m glad parameters are a little more out in the open since some of them get a little lost in Operator. As usual, there’s a lot of power in not a lot of screen real estate. (Helps when you don’t add all those silly, shiny, 3D controls.) Note that the envelope handles are straight out of Operator, as in the pitch envelope. It’s funny, because while SONAR, Logic, Reason, Cubase, MOTU DP, and others all include lots of instruments, none of them really have a consistent interface. Of course, love them or not, Ableton is all about consistency. 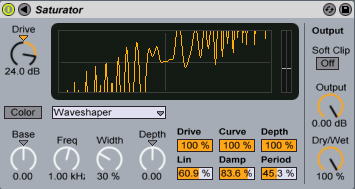 Keymaps: Nothing earthshaking, but again, nice to see this looking very Ableton-y, just as you’d imagine it. Note the “vel” switch for velocity cross-switching. This shot raises more questions than answers, like how much control we’ll really have over the multisamples. I doubt Ableton will be able to compete with NI’s Kontakt, with scripting and surround-sound envelopes and reverbs, not that that’s really the point. But this will be an area to watch. Now You’re Talking: Here’s what Sampler is all about for me. Check out the modulation section, particularly the “filter morph” option. I imagine I’ll be diving into Sampler for real sound design and sample mangling purposes, one of the reasons a lot of us use Live in the first place. (Plus, since this is built into Live, you’ll have access to this in ReWire mode inside other DAWs, too.) MIDI routing is just as exciting, for the same reason: check out all those options. This should be huge for chopping up samples in live performance, particularly with the MIDI to Loop Start option. Scratching/stuttering, right in Sampler? Sign me up. Simpler Sampler: Or is that a Sampler Simpler? The draw for many will be that Sampler reproduces the drag-and-drop ease of Simpler, but with multisamples. I always found Simpler very useful, but limiting because it could only do one sample at a time. It’s a big relief to have that obstacle removed. Can’t wait to try it myself and see if it lives up to its handsome screen grabs (and, importantly, hear how the multisampling algorithms sound). That’s got to hurt: This one is going to … distort … just a little. Still-missing information: the full list of waveshapers available. That’s the key. Tubes: Also known as what the Internet is made of. (It’s not a truck!) The controls look nice, but I want to know what this sounds like. Ableton is known more for digital crunch than warmth. Here, they’re promising both, which sounds great on paper, anyway. We’ll know soon. Cycling ’74 Jitter Cat, Escaped? : (Sorry, inside joke.) 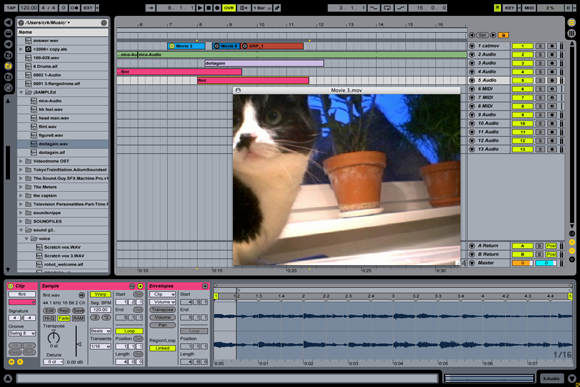 This image of the cat doesn’t tell us much … how well will Ableton Live work for serious film scoring? Managing markers becomes a big deal in film scoring, and Live currently lacks any overview of markers. I’ll be interested to see if they’ve addressed that. Regardless, though, having video will be nice.